was known to play the ballroom's organ late into the night. This is not the original. First off I would like to say thank you for posting these amazing pics and stories. I have been a fan of the Winchester house for a few years now and I finally was able to visit this summer. I enjoyed it thouroughly, but I wish that there were more stories about "ghosts" or other hauntings that have taken place around the house. I am sure that Mrs. Winchester is still there today as well as many of her other loyal workers (ie the man in overalls with a mustache). 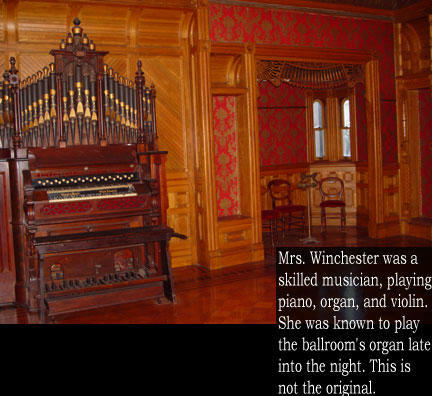 My question is, what happened to the original organ that Mrs. Winchester played? Was it sold or is it still in the family somewhere? Isn't it true that more than half of the furniture in the house never even belonged to the family and was actually donated? Anyway, thanks again for such a great site! Actually, none of the furniture in the mansion is original. It's all come from donations. Mrs. Winchester's will (which had 13 parts) stipulated that all of the furnishings be sold after her death, and that the proceeds be divided among her heirs. There is one original item left, a stove in one of the kitchens.